The contemporary trim level affords the Flying Spur sedan a more 'athletic' stance and purposeful visual appeal. Featuring exclusive 20” Black and Bright machined alloy wheels, a gloss black radiator matrix and a body-coloured lower grille bar, the Beluga specification is an enhancement for the large performance saloon that blends elements of craft and comfort. Inside the Flying Spur V8’s cabin, buyers will find swathes of piano black veneer, knurled gear shift paddles, contrast stitching to the luxurious seats and steering wheel as well as deep pile floor mats and boot carpet with contrasting leather binding. When customers also specify the highly popular Mulliner Driving Specification, in combination with Beluga specification, the striking 21” 6-spoke Extrovert wheel is included. The Mulliner Driving Specification includes features such as diamond quilted hides, a knurled gear lever, drilled alloy pedals and an indented hide headlining. In 4.0-litre, twin-turbo V8 guise it develops 507 PS (500 bhp), sprinting from 0-100km/h in 5.2 seconds. The athletic design of the Flying Spur combines traditional Bentley styling cues with a dynamic stance and contemporary details, further enhanced in the Beluga specification. Designed for comfort and refinement, the Flying Spur has benefitted from a suite of upgrades and enhancements for 2015. The cabin gains modern and tactile new features (as well as onboard WiFi) to maintain Bentley’s reputation for interior style and usability. 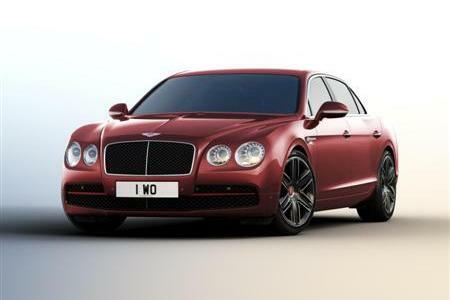 Flying Spur V8 Beluga is available to order now worldwide with first customer deliveries in the third quarter 2015.